Before starting a new motor, proper priming of the system is absolutely critical. These oil pump primers prohibit needless engine wear from improper lubrication upon initial start-up. 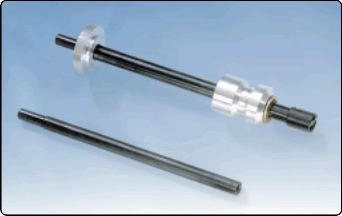 These primers allow you to drive the oil pump with a 3/8" drill once the distributor is removed. The Chevy "Pro Model" not only primes the oil pump and bottom end but also the lifters and rocker assemblies. The "Pro Model" also has a top support that locks down with the distributor clamp to provide "hands free" operation. All are black oxide finished. This kit allows you to overcome space limitations by permitting custom installation of the oil filter in any desired location. Designed for Competition or Street Rods that require the durability & look of Braided Steel AN lines & fittings. This kit comes with remote filter housing, which uses a Ford/Chrysler type filter, as well as (2) 24" 10AN oil lines & fittings. NOTE: Requires Block Adapter #21565 for Chevys, #21566 for Ford /Chrys. engines or a Milodon oiling system. These plugs solve the common high-performance engine problem of too much oil in the head area. The plug restricts approximately 75% of the oil to the top end of the engine for better lubrication and prevents oil wastage at the lifters (which will cause windage problems). This also keeps the sump better supplied with oil. Installs easily into the back of the block in place of the stock plugs. Not for use with hydraulic lifters. Plug has an allen head to allow flush mounting in the block and is made from stainless steel to avoid stripping out on removal. These vents are a key part of any highly efficient oiling system. They allow the crankcase pressure to escape unobstructed, allowing more speedy oil drain back to the oil pan and stop a large portion of the unwanted oil drain back over the cam area that causes excessive windage and power loss. Existing holes in the block are simply tapped and vents screw in. The Milodon Lifter Valley Screen Kits provides inexpensive insurance for Small Block and Big Block Chevy racing engines-especially for dry sump applications. Designed to prevent broken parts from falling into the oil pan or pump and causing serious motor damage, these stainless steel screens affix to the oil drainback holes located in the valley area of Chevy engines. Screen kit includes instructions and epoxy. Kit includes both screens & block-off plugs for over the cam area to give you an option. 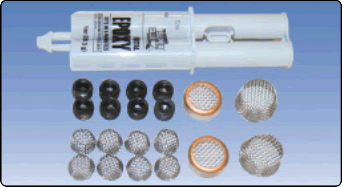 Kit includes large epoxy tube for more than adequate coverage.